« On SALE Now: Wall Mounted Art Racks from StoreMoreStore! 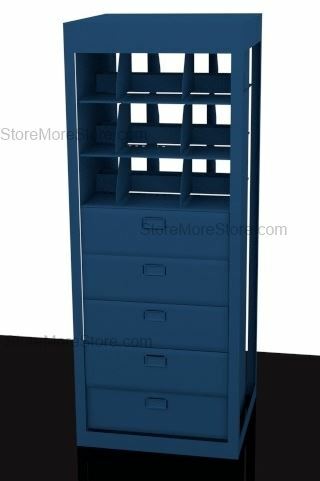 Pivoting Rotary Cabinets offer two-sided locking storage for everything in your office including files, office supplies, boxes, binders, books computer media, and more. Because the cabinets have two sides and pivot 360 degrees, they provide almost double the storage capacity of a traditional file cabinet in the same amount of floor space. Also, Pivoting Rotary Cabinets are equipped with a lock to prevent anyone without authorization from accessing stored items. StoreMoreStore has a wide selection of Pivoting Rotary Cabinets that will keep your stored items safe and secure while saving floor space. What are “Starter” and “Adder” Pivoting Rotary Cabinets? The first Pivoting Rotary Cabinet you purchase needs to be a “starter cabinet” because it can stand completely on its own. After you purchase a “starter cabinet”, you can connect “adder cabinets” to create a row of Pivoting Rotary Cabinets. The row can function as a dividing wall between offices or be placed against a wall. 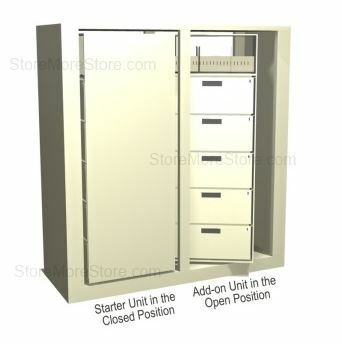 In addition, you can purchase all “starter cabinets” and have a completely modular and flexible Pivoting Rotary Cabinet storage system that can be reconfigured or moved at any time. All rotary cabinets (except 93” high cabinets) ship fully assembled, just unpack, level (if necessary), and use. Each cabinet comes with a built-in cabinet lock for security. Cabinets have a durable rotating base with 5/8″ diameter hardened steel ball bearings designed for long term use. Pivoting Rotary Cabinets are true multimedia storage cabinets designed to meet your current needs and flexible enough to meet your future requirements. Shop online now at StoreMoreStore to decide which cabinet is right for you. And if you need any help or can’t find what you are looking for, please give us a call at 1-855-786-7667.